But it's always at around this time in the summer that my feet start to protest. Dry heels, dirty feet and rough spots are inevitable when going barefoot or wearing flip-flops and sandals. I've been hitting up my supply of Dot & Lil foot soak, both the peppermint one and the tea tree & rosemary one. But asides from that, what can you do to keep your toes from looking like they've just experienced a rather unfortunate period of neglect? As I mentioned, start by soaking and then washing your feet. The longer you soak them, the softer all that dead skin will be! (yummy, I know...) Soaking my feet in cool water on a very hot day is one of my favorite summer treats, a habit I'm sure I picked up from my mom. Try the Dot & Lil foot soaks or throw in some herbs from the garden. Trim your nails now when they're at their softest, and file any rough corners. Next, you're going to want to remove all the stuff you've just softened on your heels and toes. 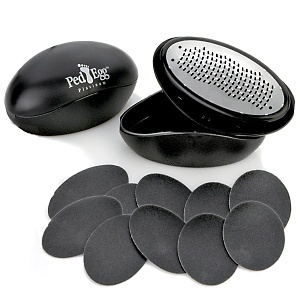 Try a pumice stone or, as I have been doing lately, one of these cool egg shaped things. I have a Revlon one and love its grater-like abilities, but this Ped-Egg one seems to have lots of gentler options too! 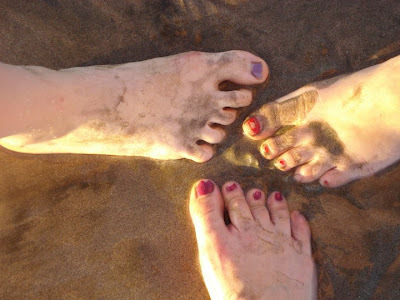 I like to combine some sugar and a bit of olive, avocado or sweet almond oil and use that to give my feet a good scrub. Moisturizes and exfoliates away dead skin all at once. In the next year or so, Dot & Lil will be introducing a nice body scrub that will be great for feet too. Finish up with a Dot & Lil body butter or another thick, rich, sealing moisturizer. And the funnest part, for me anyway, is showing it all off with a summery color. Personally, I've been stuck on coral! Enjoy these hot summer days!